What the web needs right now is another blog post about the iPad. No, don't run away! This will be different, I promise. We'll focus on Apple's A4, a custom CPU first used in the iPad. It has been widely assumed that A4 uses a licensed ARM Cortex A8 core. I have no reason to dispute this assertion, it seems like a fine choice. It has also been asserted that because the same core is used in parts from Samsung, TI, and Qualcomm, Apple should not have bothered making its own chip. Today, Gentle Reader, we'll explore that notion a bit. Apple has a long history of ASIC design. Apple produced custom silicon for various Macintosh models since at least the late 1980s, when they designed the audio chips used in the Quadra 700 and 900 (a chip called "Batman"). Later, Apple designed entire chipsets to interface with the PowerPC 60x bus. Apple licensed a gigabit Ethernet MAC design from Sun, and used it plus IDE controller and other peripherals in chipsets for several Powermac models. With the switch to x86, Apple's efforts became much more constrained. 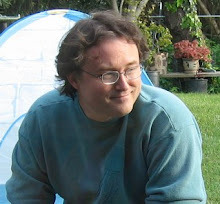 The x86 bus interface is difficult to license, and Intel's own chipsets are quite reasonable. So far as I know, x86 Macintoshes no longer use custom Apple ASICs. Custom chip design isn't a radical departure for Apple. With that as background, what might Apple have done in the A4 chip? I have absolutely no inside information about the iPad or A4 processor, I'm going to make stuff up because its fun to speculate. Apple holds a nearly 10% stake in Imagination Technologies Group, which designs the PowerVR graphics accelerator and other IP relating to massively threaded processing. Apple uses their PowerVR SGX 535 in iPhone 3GS, and used various PowerVR graphics in earlier iPhone models. The A4 chip will certainly integrate a graphics core from PowerVR. As with essentially all GPU designs today, the PowerVR makes use of multiple, specialized CPU cores. There is relatively little information about its instruction set on the web, only that it is called META MTX and uses 16 bit RISC-ish instruction words. 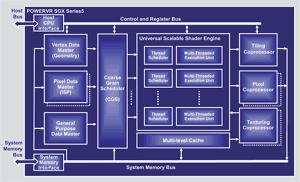 Update: PowerVR SGX does not use the META architecture, it has a distinct architecture of its own. Additional information can be downloaded after registration. Apple has also invested heavily in two relevant technologies: OpenCL and LLVM. OpenCL allows processing to be distributed across multiple CPUs in the system, even if they have different instruction sets. OpenCL algorithms are written in a language with syntax very similar to C99, and the framework handles the rest. LLVM is a compiler toolkit, one aspect of which is a machine independent instruction set. Source code can be compiled to the LLVM virtual machine, and from there be translated into the equivalent opcodes for the target CPU. The compilation can be done statically before running it, or by a Just-In-Time compiler while interpreting the LLVM bytecodes. iPhone applications are compiled to ARM instructions, but it is not much of a stretch to imagine support for sections of LLVM bytecodes as well. If the hardware has sufficient GPU power, the bytecode could be translated to the GPU instruction set and offloaded. Devices with less sophisticated GPUs would use the ARM instead. Apple does not allow iPhone apps to include their own virtual machine in this way, but would be free to provide the VM function as part of the OS. I suspect this is the most compelling reason for Apple to build its own chip as opposed to buying off the shelf. The rest of the mobile industry is satisfied to offload 3D graphics and video decoding to the GPU. Apple has greater ambitions, and could make use of significantly more GPU pipelines. By controlling the complete platform from CPU to software, Apple can make tradeoffs which are not practical for the rest of the market. For example: a very large GPU plus very fast ARM would generate more heat than can be dissipated in a small form factor like a phone. Apple has the option to dynamically throttle the ARM clock speed in order to open up more thermal envelope for the GPUs, if sufficient OpenCL workload is ready to run. When the GPUs are less busy, the ARM clock speed can be brought back up. The CPU in the iPhone 3GS is a Samsung S5PC100. This is a multi package module with CPU, I/O chip, and SDRAM sandwiched tightly together. Multi chip modules have been around for a long time, where multiple dies wired together in one big package. The amount of testing which can be done on a raw die is rather limited, so MCM yields suffer as one bad die ruins the whole assembly. Multi package modules are relatively new: each chip is in its own package, but use very tight pin spacings and do not have a heat spreader. They are soldered together on a small PCB, which in turn has a Ball Grid Array on the bottom with normal pin spacings. Because each chip is packaged separately a full suite of test vectors can be run before the final assembly is put together, improving the yield considerably and lowering the cost of the final product. If we examine the main board of an iPhone 3GS, the largest component is not the Samsung processor - it is the Flash memory, an MPM containing a number of flash chips. The Samsung CPU in the iPhone 3GS comes in a close second in size, and is also a multi package module with CPU, I/O chip, and SDRAM. With the A4, Apple will probably have one die containing both CPU and I/O. Samsung uses different I/O chips to tailor their offering to many market segments, which is not a goal for Apple. By arranging the pinout carefully, Apple might be able to make an MPM containing CPU, SDRAM, and Flash, reducing the total board area. Different Flash capacities could be offered by not stuffing portions of the MPM. The iPad itself might not need such an MPM as it is a much larger device, but future iPhones would benefit more. To be clear: assembling an MPM is not something you can easily do when buying merchant silicon. The pins on one package have to be arranged so as to be easy to route to the pins on the other packages within the MPM. I'll say it again: I made this all up. I have no information on the specifics of the A4, just speculation. In the unlikely event that anyone reads this (instead of running away from yet another iPad blog post), don't copy it into Wikipedia as though it were verified information. What about future iterations? Its tempting to consider a single chip containing the entire iPhone feature set, including radio and wireless networking. The A4 itself clearly doesn't do this, as GSM support is optional in the iPad. I suspect that even in future chips, Apple won't pull in the baseband radio. The front end portions of that chip are rather sensitive to noise, and generally don't work well when integrated in the corner of a gigantic ASIC. Also integrating the radio functionality would make it that much harder to keep up with advancements in wireless networks. Another future possibility is to use this chip in Apple's other small form factor products, like the Airport Base Stations, Time Capsule, and AppleTV. This is certainly possible, but aside from obvious additional peripherals like SATA I'm not sure it adds many requirements to the chip. The New York Times writes about the history of the A4 design team. Louis Gray writes about Apple's heavy recruiting push to staff up their ASIC team. Wikipedia already has an article, which will improve over time as more details emerge. P.S. : While we're at it, the title of this post is a guess about the origins of the "A4" nomenclature: "Apple" is a capital A followed by four more letters.